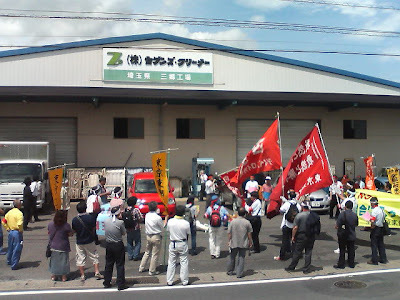 Now Workers at a Honda Component Plant in China Go on a Strike - Never Tolerate the Intimidation with Dismissals! 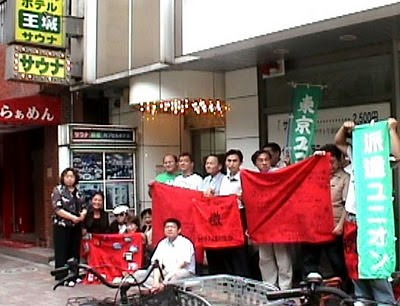 As the strike at a factory supplying parts for Honda Motor Co. has ended, a new strike has begun at a Chinese factory of Atsumitech (in Hamamatsu), a component manufacturer 48% of whose capital is funded by Honda (see the photo). The following is a call from the striking factory. "We started a strike on July 12. 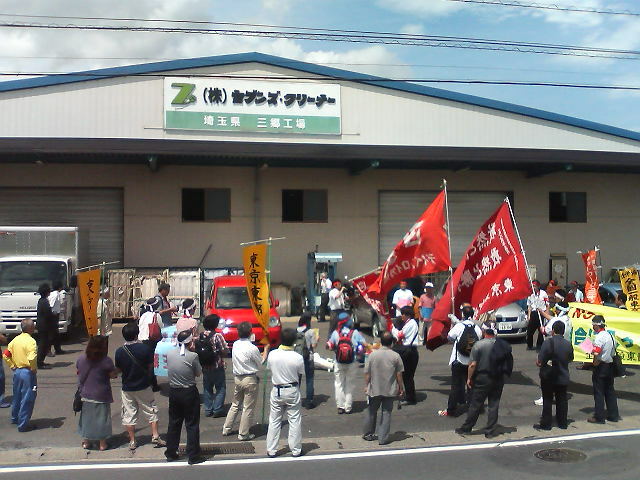 A lot of workers are joining the sit-ins inside or outside the factory. They sought assistance from the employment department and the government's department concerned when the Japanese party would not respond to the request for talks. However, this attempt did not bring about any solution. Thus, the workers have decided to call for support via the Internet. The most disgusting thing is that the company has announced a planned discharge of all 90 or more workers that have joined the strike. 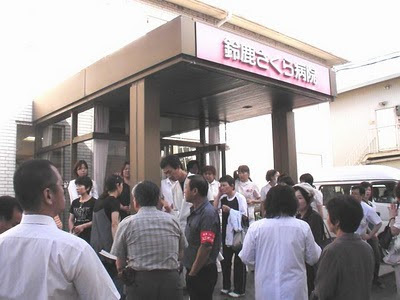 They are pressing the workers to cancel the employment contract in the afternoon on July 14 and leave the corporate dormitory. Protect the rights of workers! Our struggle is going on!" 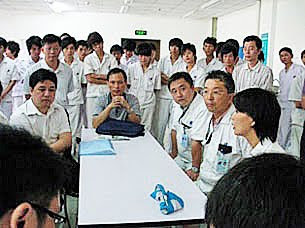 (By our International Division) Photo: By the courtesy of a China-based local website. Analogue TV broadcast will stop in July 2011, when digital terrestrial broadcast starts. From July 5 this year, a black stripe with a message urging viewers to buy digital terrestrial broadcast TV set will appear on TV screens for viewers watching analogue broadcast. The Ministry of Internal Affairs and Communications is promoting digital terrestrial broadcast as a state policy, but its intention is not quite clear to us. There are also difficulties such as delay in the spread of reception equipments and eliminating hard to view areas. But there is no criticism to the shift in the mass media, because TV broadcasting companies are promoting the shift to digital broadcast. So the working poor people are the most unlucky. 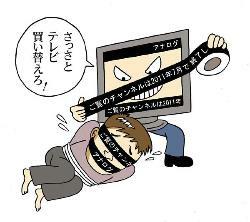 Why do they have to buy a new TV set; why there is no alternative; why do they have to watch harassing black stripes? This shift to digital broadcast is full of doubts. 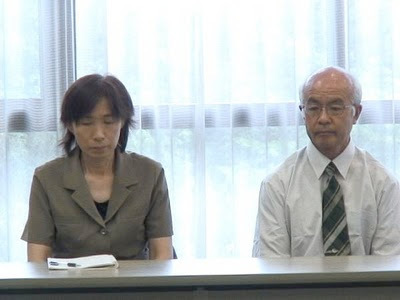 Victorious settlement for Sauna Oujou Union Autonomous operation ends. 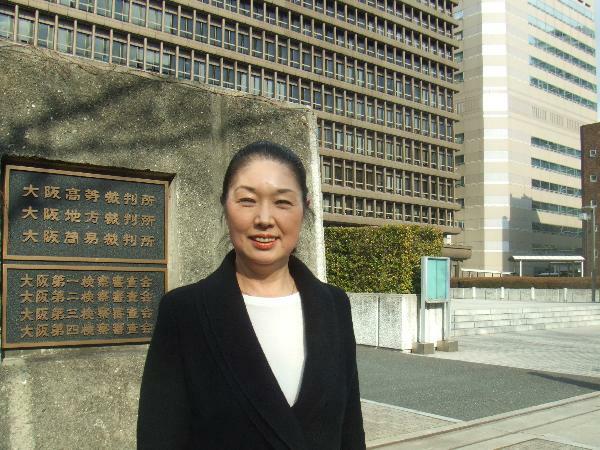 “No to discrimination against North Korean Schools. 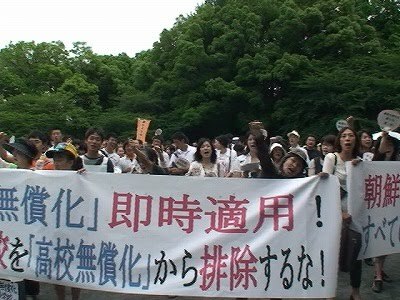 Don’t exclude North Korean Schools from free tuition program for high school” Citizens’ Action was held at Shiba Park, Tokyo on June 27. 1000 citizens attended the action and more than 140 organizations, more than double the number for the previous action, signed the endorsement for the action. 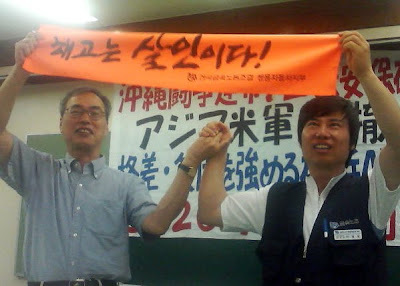 Lee Yeong-ho , who fought the 77 days strike against the mass dismissal at Ssangyong Motors in the summer 2009, visited Japan and attended a solidarity meeting held in Shibuya, Tokyo on June 20. 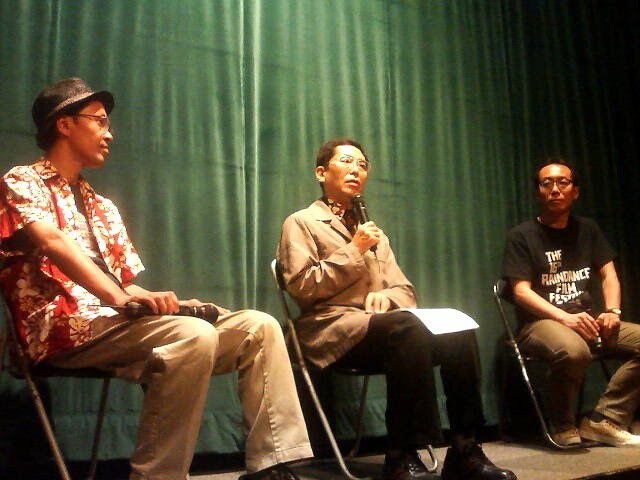 A documentary film featuring the Ssangyong struggle “You and my war” was shown at the meeting. Lee expressed his determination to fight on. 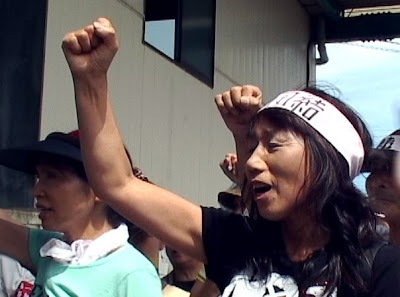 “During the strike we occupied the factory and the company stopped water and gas supply. When workers got sick, we couldn’t get a doctor or have medicine brought in. The mass media blamed the workers. But, it was a matter oflife and death to fight restructuring dismissal. We had to use slingshots to counter the violence of the police and the company. Dismissal means killing workers! Right now, we are suppressed severely, but we will finally win and go back to work in the factory,”The film “You and my war” will be shown at the Labor Film Festival 2010 on July 24.
outsourced by a dispatch agency, Culture Club. deduct 5% from his pay for managing his work schedule. job unless it drew contract with him. from that of any other employee. responsibility Culture Club has in this dispute.